Buying up raggedy old Kynoch Killers for refurbishment over the close season kept me entertained until the season started. The palavor of painting the plugs with all the messing about that entailed was good fun. By extension, the finished baits now required new mounts to complete the job. I use two slightly different versions and here is how I make them. The main ingredient of the mount is a double barrel swivel. These are readily available from major retailers and are handy for this job as they are just the right size for threading through the hole in the plug. 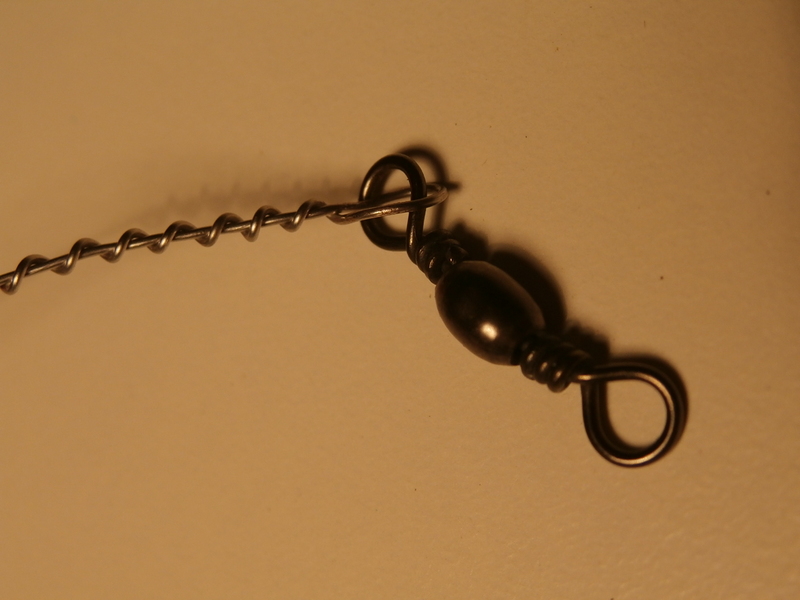 Fit a large split ring on to one end of the double swivel. This ring needs to be big enough that it won’t pull through the hole. Add a large treble to the split ring and voila! The other version I use has an additional swivel in it. 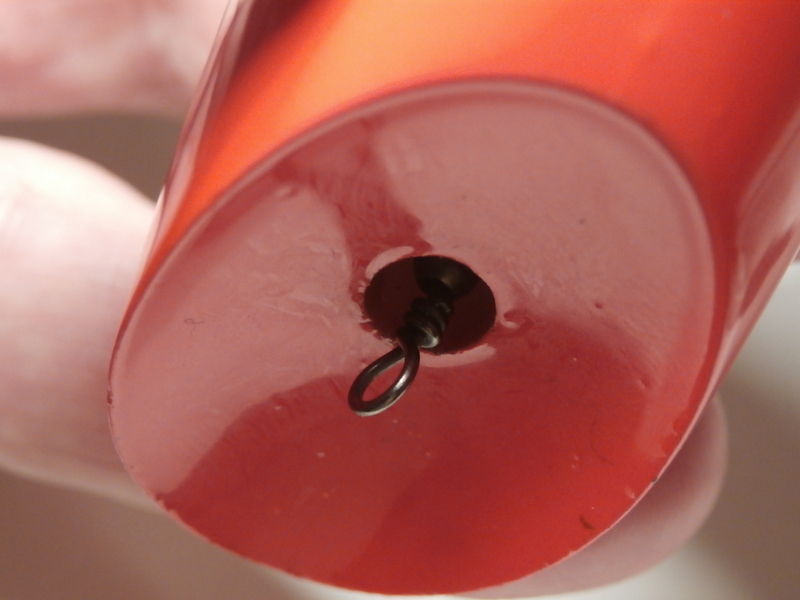 This allows the hook to be positioned further down the bait and may (or may not!) improve hooking. When you see the position of the hook on the Tomic plugs it is further back than on the ‘normal’ Kynoch and that is what I am aiming for. Follow all the instructions above but don’t fit the treble. Instead you add a normal barrel swivel to the large split ring. Next, I fit a smaller split ring to the other end of the barrel swivel. Fancy a change? Those lovely red Owner trebles look good on these mounts! A confession first, I don’t know much about Kynochs and their kin. You see they were never really part of my armoury when I fished in Scotland and they are far from common here in Ireland. I am becoming more interested in them now though as I seem to be doing more and more trolling each season. With less and less time available to fish every season I have to take whatever conditions are allotted to me, meaning I am confronted with days of flat calm and/or dazzling sunshine. Faced with hopeless weather for the fly, I need to be flexible and that’s when the trolling rods come out. ABU Toby’s are the first choice but I have a sneaking suspicion that the Kynoch should work too. With apologies to the stalwart harling men and women of the Tay, here is the little I know of these plugs. This plug originated in USA back in the 1940’s and it was made of wood in the beginning. Somewhere along the line the Luhr Jensen company became involved and turned it into the plastic J plug. I don’t know how or when the plug crossed the Atlantic but Iain Kynoch a fisherman and and toolmaker picked up the lure and pretty soon the Kynoch Killer was born. 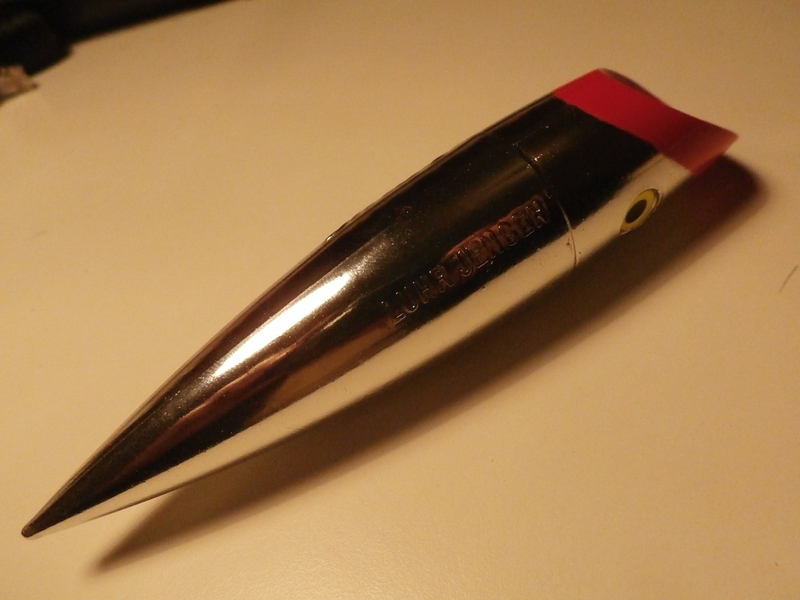 Iain patented the lure and ABU of Sweden made the Kynoch Killer under licence between 1973 and 1976. I think I am right in saying that the moulds are still in hands of someone in Scotland. Another, very similar plug called the ‘Lucky Louis’, also hails from America. This is very similar in shape and size to the Kynoch. Then there is the Tomic. Around the same size, this one hails from Canada where it is used used for mooching on the great lakes and the western seaboard. And of course there is the Tay Lure itself. Same shape and design but this one runs deeper in the water. Colours range from all gold, through silver and green to ruby red and include the famous pink and white variant. Tomics come in a wide range of often garish colours. All of these plugs were designed for the same use, trolling or harling behind a boat. The quarry is usually salmon but pike and lake trout also fall for their charms. The concave face of these plugs forces the water over the top of them, pushing them down deep, important in the strong, deep flows of the lower Tay. I am hoping they will also run deep on Lough Conn and seek out salmon from lies which other lures are fishing too high above. I have been buying up a few of these plugs over the winter, some as good as new and others in varying states of disrepair. They seem to appear in sudden flashes on ebay. I don’t see any for weeks on end then there are lots to be had. Some are sold singly but it is common to see them offered for sale in wee batches of 4 or 6 plugs. This is a mixed blessing as you can quickly acquire a range of baits but very soon you find ‘repeats’ and you buy 6 baits when you only really want a couple of them. While I am in complete awe of their abilities my own skills are somewhat lacking when it comes to fancy paintwork. I settle for some quick licks with a brush and some new hooks. 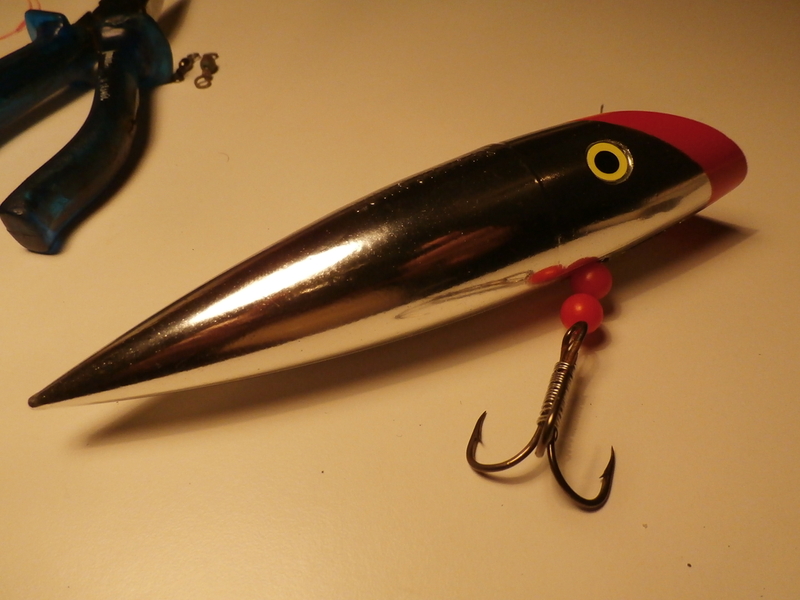 I have also invested in a cheap second-hand air brush and will attempt to do a slightly more professional job when painting lures in the future. This one definitely needs a lick of paint! I am planning of trying the pink version next season. I understand pink was (is?) a very popular colour on the Tay but I can’t say that I have used or even seen a pink plug fished on Lough Conn. I don’t see why a pink coloured lure wouldn’t work and maybe just the fact that it is something different could be in its favour. I have one pink Kynoch in the box ready for the 2018 season, so let’s hope it does the business in the spring. 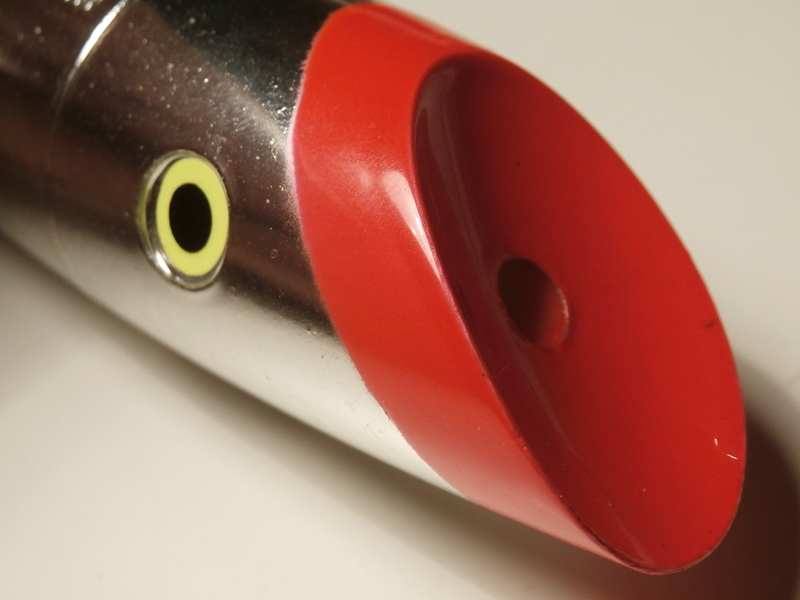 The J Plugs are available in metallic finishes for those occasions when you really want to waken the fish up! In terms of how to fish these plugs it seems to be fairly straight forward. A shortish rod sticking out the back of the boat, commonly referred too as the poker and an old reel that will hold enough 20 pound line will do. The Kynoch is then fished quite close to the boat, around 15 yards for example. This allows the lure to work in the turbulence created by the engine, adding to the crazy darting action it already demonstrates. I will post some pics of the finished Kynochs once the paint jobs are done. Rain over the bank holiday weekend has pushed up water levels a bit so we decided to try for a springer today. Waiting for Ben outside the house in warm sunshine it really felt like spring was here at last. The trees were filled with chirping birds amid the early blossoms. I caught up on all Ben’s news on the short journey out to the river (he had a 10 pounder off Lagduff on the Owenduff on Saturday) and we assessed the chances for today. The river had risen over a foot but was now dropping back . Word was that a couple of salmon had been caught on the Moy system recently, one at Pontoon bridge and another at Foxford. All of this sounded good and we were pretty hopeful there was going to be a fish or two in the river today. Peering over the bridge the water was tinged, but not too coloured. Gear was hastily stowed on the boat and we motored up river in good spirits. An hour later and we were beginning to flag. No signs of fish at all and the warmth of the morning was disipating as clouds rolled in from the south west. A thin drizzle began to fall, washing our confidence away. Conversation died and we sat hunched in the boat, each of us lost in our own thoughts. ZZZZZZZZZZZZZZZZZZZZZZZZZZZZZZ, off went Ben’s rod as something fishy grabbed his Kynoch. After the first run everything went dead and we both knew what that meant – PIKE. This lad headed for the weeds and had to be bullied back out into open water before he could be boated. By the time we pulled in to have a bit of lunch we had 3 pike between us, all between 4 and 5 pounds in weight. Of the silvery salmon there was no sign. After a soggy lunch, consumed behind a brier in a cold and wetting mist, we met some fellow anglers who were bait fishing with similar results as ourselves. And so we turned for home and headed back the way we had come. Another pike and then 2 trout were boated as we retraced our steps. Both trout were, just like the ones we had on Friday, in perfect condition, deep bodied and well fed. I suspect these are fish from Lough Cullin which came up the river to spawn and have hung around due to the good food supply. We called it a day when we got back below the bridge and tackled down at a leasurely pace. Salmon fishing is a numbers game, the more often you fish the more salmon you will catch. Today was not our turn but that wont stop us from trying again soon. Get out of those weeds! With work beckoning tomorrow and the forecast of cool, wet weather for the whole week I am now resigned to no more fishing until next weekend. While mooching around in a small tackle shop down an alley in Athlone the other day I happened upon a basket full of odd and ends of tackle sporting the tempting sign ‘half price or less’. So I plunged into the task of sifting through the assorted rigs, floats, baits and sinkers. Luminous poppers, bouncing bettys, zoomer floats and myriad other angling oddities were closely examined and rejected. Then, right at the very bottom of the basket my eye fell on a huge shiney plug. Ah ha! Now this was interesting. I asked the shop owner ‘how much? ‘Three Euro for that – it is supposed to come with a special mount but it’s missing’ As this lure normally retails around €12 I had bagged myself a real bargain. All I had to do was make up a new trace and I was in business. This is a an American version of what we Scots call a ‘Lucky Louis’, a much loved harling lure from the lower reaches of the mighty river Tay. Another version was called the ‘Kynoch Killer’. What makes these lures so successful is the incredible action when trolled behind a boat. They dart around with an extreme action which has to be seen to be believed. Another advantage of this lure is that when you hook a fish on it the body slides up the line and out of the way so the fish can’t exert any leverage on the hooks. All I had to do now was make up a short trace for passing through the lure. 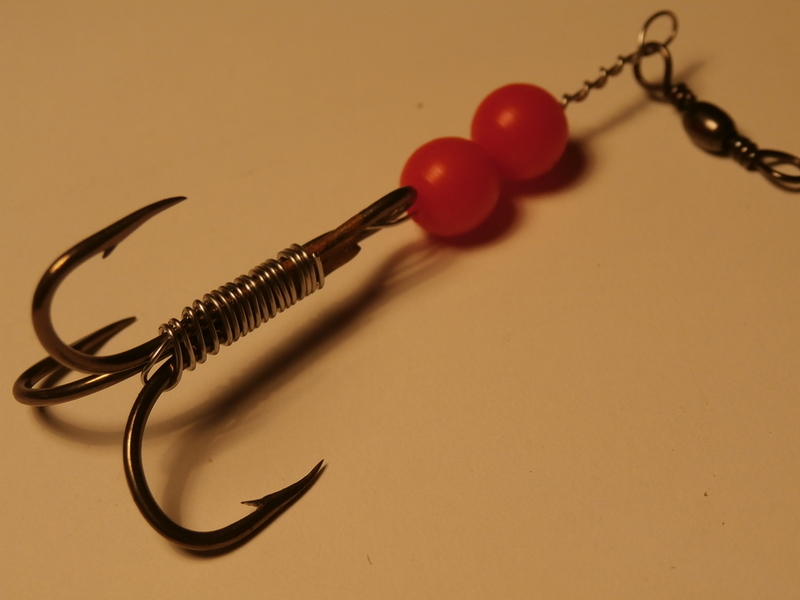 There are different designs of trace, some featuring two lethal looking trebles linked with flexible braid. I much prefer a simple trace with just one treble. I use stainless steel wire for the trace and wrap it to the swivel. Now slide on two beads (I like red ones, but use whatever colour you prefer). Measure the length of the trace by offering it up through the hole and marking the point where the eye of the hook needs to be. 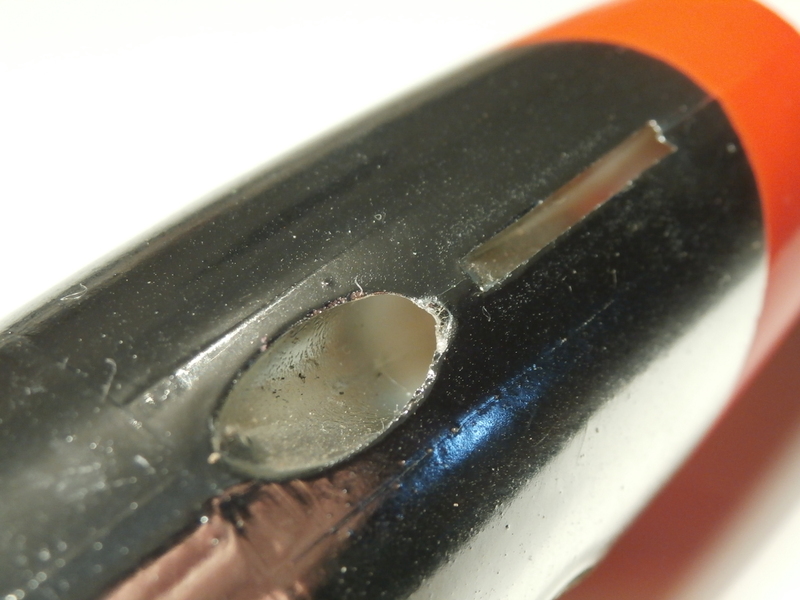 You want the swivel to poke out of the head end of the hole. Now attach the hook by threading the wire through the eye, passing it around the bend of the hook and wrapping it back up the shank (see below). What you end up with is a short trace with a swivel at one end, two beads in the middle and a treble at the end. Why two beads? I like to have the hook sitting a little bit away from the large body, I think it gives better hooking. Now I am going to have to sit down in a dark room for a while after parting with THREE EURO.